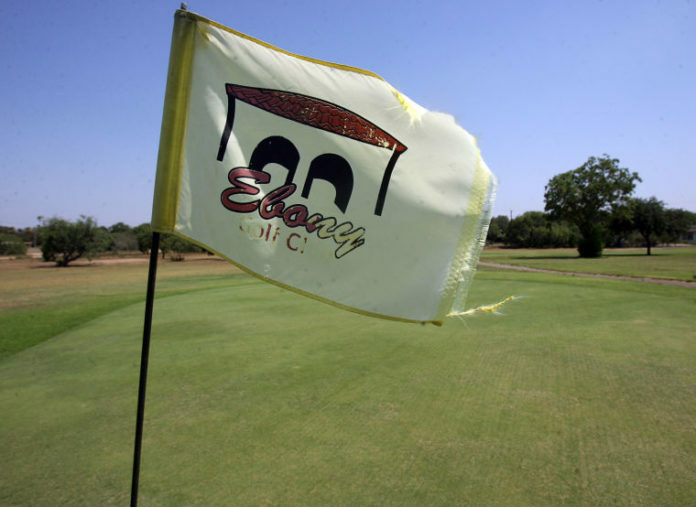 A golf course flag flies in the wind at Ebony Hills Golf Course in Edinburg. EDINBURG — Residents here have a unique opportunity to decide the future of the Ebony Hills Golf Course, a green jewel that sits at the heart of the city, but it won’t happen without community participation, attorney Mark Peña said. Edinburg council members appointed Peña earlier this month to chair a citizens’ committee that the council recently created to help revamp the 66-acre property located near the historic Echo Hotel. Tucked between Freddy Gonzalez Drive and south Closner Boulevard, the city-owned golf course is running at a deficit, and city leaders had initially voted to declare it surplus property and authorized the mayor to execute its sale. But after pushback from members of the community, who gathered almost 2,000 signatures on a petition to save the greenspace, the council officially rescinded the action. Edinburg residents Bill Carlson, Jack Wallace, Ki Brush, Ray Chavana, Bobby Chavana, Gary Mounce, Leo Cadena and Pete Diaz will also join Peña on the ad hoc committee, which will host its first gathering of the minds Thursday at 6 p.m. at the Dustin Michael Sekula Memorial Library. The main role of the committee is to gather information and explore ideas for the future of the golf course with the possibility of turning it into a multi-use park. Peña, who lives near the 9-hole course, knows that there are many people living near the property and away from it that want to keep it a golf course, but he believes it’s time to consider other options that could bring value to a larger base of the community. He envisions a pitch and putt, or rather a smaller course, that can share space with hike and bike trails and open spaces for families to enjoy nature. World-class pitch and putts are usually about 15 acres or less, he said. “There’s no question that it’s a challenge because there’s citizens who love their golf. It’s been a golf course for almost 100 years,” he said about Ebony Hills, which opened in 1927. Still, he says, most of the time the course is empty. Golfers tend to play at certain times during the spring and summer months, and even with the addition of Winter Texans in the cooler months, it’s not enough traffic to justify its continuation solely as a golf course, he said. That value can come indirectly, Peña said. “Sometimes people are looking for dollars, and the dollars that come in from parks are not direct. They’re indirect. People want to be in the city — they want to live in the city so they can access the park,” he said. Peña believes the property could also sustain an outdoor venue for music acts or other events, such as movies at the park.